The camera scene is red-hot at the moment, with spectacular models available at every level. 4K rules supreme, it is a great time to upgrade or consider the options as the action unfolds. Announced at IBC in September is the Sony PXW-FS5. Here we have an extremely lightweight 4K camera - shoots 4K 4:2:0 at 100mbps, and 10- bit 4:2:2 HD at 50mbps. Record slow motion at up to 240fps, and there will also be an option for RAW output to external recorder. Blackmagic URSA - this is now shipping for the 4K model with the 4.6K sensor available in November. This is a a break-through camera for Blackmagic, perfectly weighted and designed for cinema, television or documentary production. Capable of recording 4K RAW or ProRes, great form factor, able to handle full-frame lenses to B4 depending which model you purchase. JVC GY-LS300 - a camera I know well and love! Shoot 4K at 150mpbs to affordable SDXC media. Light in the hands, works with Micro Four Thirds lenses or full-frame lenses with adapters. All the reports running on Movie Machine from IBC 2015 were filmed with the JVC GY-LS300 and Nikon lenses. Panasonic DVX200 - great looking camera, featuring Micro Four Thirds sensor and built for tripod or on-the-shoulder filming. This comes with EVF attached, and 4K recording up to 200mpbs. A good all in one model with fixed zoom. Canon has a spectacular range: the C300 Mark II, the C500, and the C100 Mark II for those shooting HD. 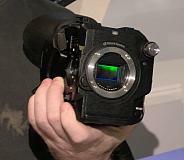 Most recently Canon showed a prototype 8K camera. The never ending quest for higher pixel count continues to be pursued by the camera manufacturers. The Sony FS7 - the camera announced a year ago at IBC is still going strong, and now more affordable than ever. The gap between the PXW-FS5 and PXW-FS7 in terms of price is not huge, however, these are very different kinds of cameras. The Sony A7SII. Now features internal 4K recording! Then there is RED! Just in the last week RED Digital Cinema announced RED Raven - an affordable 4K cinema camera, complete with Canon EF mount, to be available in 3 configurations. Capture options in both R3D and Apple ProRes 422, 422 LT, or 422 HQ. Never before have I seen so much action going on in the world of cameras! There are many models I haven't even mentioned, I've only referred to some of the new and exciting announcements. When I started in the late 1980's a Sony Betacam, shooting SD 4:3, was around $80,000. Now the camera world is on fire with 4K models with incredible low-light performance, tremendous quality, extremely long battery life, affordable media, and wonderful choice of interchangeable lenses. Now is a great time to be in the market for buying a camera, or to be working with any of the current technology. Capturing images using a 4K RED DRAGON� sensor, RED RAVEN reinforces REDs commitment to its core principles. RED was founded on the belief that cinema-quality creative tools shouldnt be in the hands of a few - it should truly be 4K for all. SONY PXW-FS5: FEATURES AND SPECS. The Sony PXW-FS5 is the latest addition to the Sony range of professional camcorders with superior creative features and flexible shooting. The versatile grab and shoot style PXW-FS5 provides unsurpassed on-the-go shooting in the most demanding of conditions, with stunning image choices and creative features. Complementing the successful PXW-FS7, this compact camcorder delivers high quality imagery suitable for a range of professional applications from event videography to corporate and online video production. At IBC 2015 Blackmagic Design introduced the Blackmagic URSA Mini B4 Mount which is a B4 lens mount modification for its new Blackmagic URSA Mini PL camera that lets it use broadcast HD lenses. Since URSA Minis launch at NAB, feedback from broadcasters has been overwhelmingly positive, and now they will also be able to use their existing high definition B4 broadcast lenses with Blackmagic URSA Mini. Blackmagic Design has announced that the final release of DaVinci Resolve 12, its professional editing and color correction software, is now available for download from the Blackmagic Design website. The MTF EFFECT 3 is now shipping and MTF are accepting pre-orders for further units. The new MTF EFFECT 3 controller is now wireless and will retain all of the features that made the MK2 so succesfull, plus the addition of precise focus control. Canon Inc. announced that it is developing a Cinema EOS System 8K camera and professional-use 8K reference display that will support the production of next-generation 8K video content, along with a still-image single-lens reflex camera equipped with a CMOS sensor featuring approximately 120 million effective pixels. Through the Companys proprietary imaging technologies, Canon provides still and video input and output devices that will contribute to the development of imaging culture. Canon Europe, a leader in imaging solutions, has announced that its parent company, Canon Inc., is developing an APS-H-size (approx. 29.2 x 20.2 mm) CMOS sensor incorporating approximately 250 million pixels (19,580 x 12,600 pixels), the worlds highest number of pixels for a CMOS sensor smaller than the size of a 35 mm full-frame sensor. AJA Video Systems have launched the FS3, the newest product in the company's line of FS professional frame synchronizers. Available exclusively through ARRI Rental, the ALEXA 65 has already been supplied to numerous high-profile projects, some using it as the main unit camera throughout production and others using it as a specialist camera for sequences that require extreme levels of image quality. Telestream�, the leading provider of digital video tools and workflow solutions has shown the latest version of its Episode video encoding software at IBC 2015. Scheduled for release in early Q4 2015, the new version brings bigger performance gains, added format support, and easier to use features. I flew to Florida for a shoot. The brief was to film many short interviews to camera. I was told to bring lighting and audio gear. I asked if we needed chroma key - "no chroma key" was the answer. I'm onsite in Miami, scouting locations around the hotel, looking for places to film. The client suggests a few locations outside - I check these out and they are noisy beyond belief. Music blaring, the sound of a DJ, people swimming... Not only that, my lenses are fogging up in the Miami humidity, and the bright sun makes it impossible to stand outside without squinting. This is not a good filming environment. The client suggests we film inside the hotel - however, they want everyone in one place. We have at least 15 -20 people to record to camera and they don't want us running all over the hotel. Then the clients says: "Why don't we film this chroma key"
I tell the truth: "I didn't bring my chroma key screen. I was told it wouldn't be needed...."
As quickly as I say the words I come up with a solution. I'm in a cab on my way to Target. I buy sheets, green, blue, the best I can get which are rich and deep in colour. They didn't have what I wanted so I did the best I can. I return to the hotel - stands and blue table cloth have been provided. There are several of us on the case to make this work. For 3 days I film people speaking against the sheets and table cloth. I'm so worried about it not working that I have laptop set up next to the camera/lighting setup - I test every chroma key before filming (I have to know it is going to work). 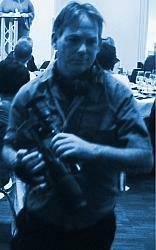 (i) everything was filmed 10-bit 4:2:2 and recorded to an Atomos Shogun recorder. The job was HD. I'm convinced the 10-bit 4:2:2 recording helped me produce really good keys with basic equipment. (ii) The room was well-lit and I had additional lighting on each of the people speaking. The result was a well-lit, evenly lit, chroma key background. Had the room been dimly lit, or patchy on the chroma key background, I'm sure the results would not have been so good. (iii) I use Final Cut Pro X for the chroma keys. FCPX does really good chroma keys with the minimum of effort. It is one of the best I have used! So, always be prepared. Even though I was told no chroma key the client needed chroma key. That's what's it's about, delivering whatever the client needs. I'm very happy I was able to get this done and sorted, and I've definitely learnt for next time how to do a chroma key at short notice with the minimum amount of equipment.